Failing to properly configure an industrial computing device can lead to unresponsive touchscreens. Do you know that such kind of technical problem exists? Actually, most of us often install software on our touchscreen PCs without configuring the system. But, this can result in delayed interface responses. This can greatly impact the system productivity, especially for industrial operations. Now, always bear in mind that panel PCs used for industrial applications require proper configuration. This is to optimise its overall performance and offer better functionality to the users. So, it would be ideal to contact a technical support to prevent any touchscreen software error. But, how can a technical support help you in configuring an industrial touchscreen PC bearing a Windows® 10 operating system? Read more on this article and get to know an easy guide to the proper calibration process. More industries are now integrating industrial computers with touchscreen features because of its remarkable benefits. One main reason is that using these devices can enhance work productivity [Gainco]. However, these devices are also prone to several touchscreen technical issues such as response delays. And most likely, the general source of the problem is due to improper setup, calibration, and compatibility with the operating system. 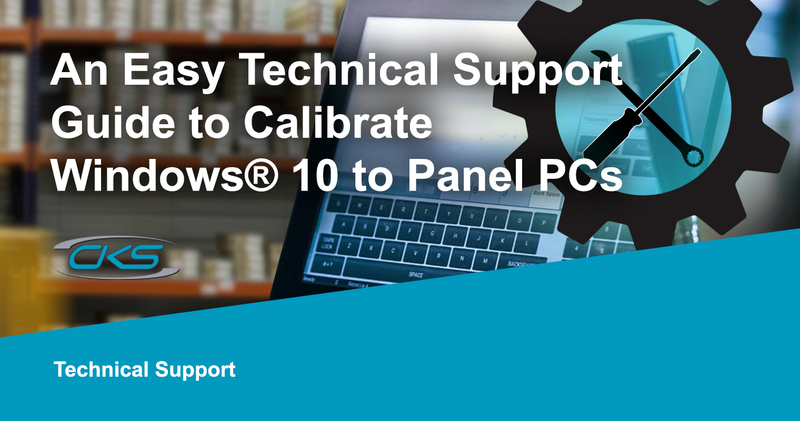 So, here is a recommended guide from a technical support on how to calibrate a touchscreen PC with a Windows® 10 Operating System. A tech support can provide you with a device driver which can make it easier for you to calibrate the system. The most popular one is the eGalaxTouch® software. All you need to do is install this program and run it. Upon opening the software, select the “hardware” tab, click “hardware calibration”. Then, in the next window, click “ok” to begin the process. Lastly, select the “tools” tab and click “clear and calibrate”. This will lead to an on-screen window with several instructions. Follow these instructions to finish the 4-point calibration. But, make sure a tech support is guiding you through the process. Utilising a computer program can be the easiest way to calibrate the industrial computer. But, there are also instances in which the program cannot complete a certain procedure. What’s worse, there can be multiple and complex reasons for this occurrence as well. So, for the right calibration process, contact technical support and keep your computing equipment performing at its best condition. Windows® are either registered trademarks or trademarks of Microsoft Corporation in the United States and/or other countries. All other trademarks are the property of their respective owners.